The winter months were mild, windy and wet. Spring was hot and summery. From May through the end of July, the weather deteriorated to rain, wind and thunderstorms, often with hail. Nice weather returned August 24, causing the grapes to mature early and unevenly from one cru to the next. The earliest crus started picking on August 23, but the majority were harvested around September 2. The grapes were healthy with a good balance between alcohol and acidity. This cuvée is designed to appeal to the most discerning palate and, more generally, anyone looking for a touch of romance in their apéritif. Its freshness, with notes of red fruit (strawberry, raspberry and redcurrant), provides a smooth, comfortable sensation that lingers with hints of pink grapefruit. 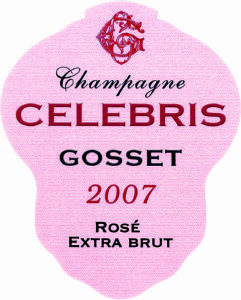 Suggested Pairings: The CELEBRIS Rosé Extra Brut 2007 can be served as an accompaniment to carefully chosen dishes such as salmon, a strawberry and tomato gazpacho with basil, or pan-fried scampi.